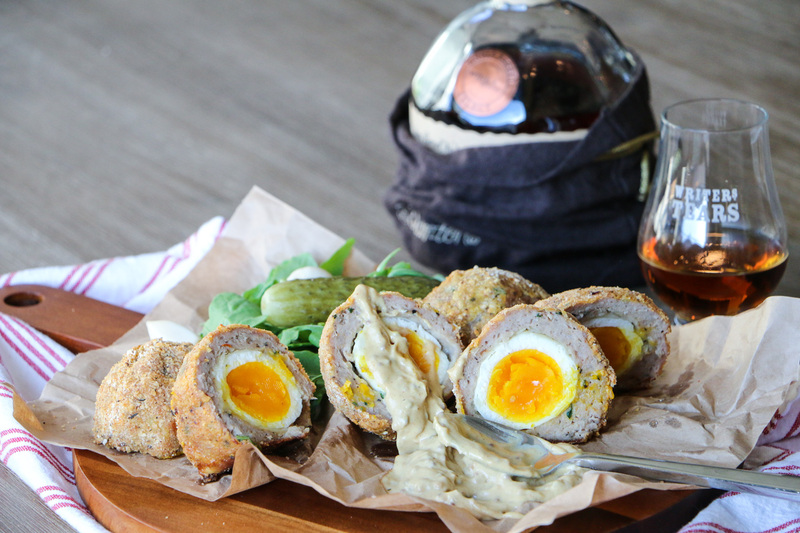 I like to describe Scotch eggs as little protein balls filled with yummy goodness. They are typically deep fried, but since I like to keep things a bit healthier I bake mine. The results are the same, however baked Scotch eggs will typically have a flatter bottom since the meat mixture sets onto the cookie sheet during baking. Looks, schmooks – it’s the inside that really matters! Scotch eggs are my absolute favourite snack to have on hand. Sometimes I make a whole boat load at a time and keep them in the freezer (uncooked) so I can bake them when I have cravings. I recently saw a picture of a Scotch egg with a runny yolk and became determined to make that. My only concern was that I wanted to baked them, not fry them! It’s so much easier to achieve runny yolks when you fry because the cooking time is drastically reduced. I searched online to find a recipe where someone actually achieved a runny yolk while baking… but no dice. So I decided to do a little experiment. I wanted to see what kind of yolk would be produced with an egg that was raw, boiled for 2 mins, 4 mins, and 6 mins. Obviously it would be impossible to form the meat mixture around a raw egg, so I decided to freeze it. All of the eggs that I boiled for the specified times were placed into an ice bath for 10 mins to stop the cooking process, then I placed them in the freezer for 3 hours along with the raw egg. When I took the eggs out of the freezer, I noticed that the shells of the eggs had cracked. This occurred because the egg whites expanded while freezing. The shells were surprisingly easy to remove by just running a bit of hot water over it. I worked quickly to prepare the Scotch eggs because I didn’t want the frozen raw egg to melt on me. I popped them in the oven and watched them bake. As I expected, the Scotch egg with the raw egg started to deflate. 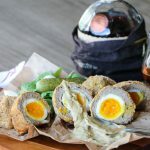 The raw egg method has been utilized successfully for deep fried Scotch eggs, so I really doubted that it would be successfully replicated in a baked version. Due to the longer cook time required for baking, it just didn’t work. 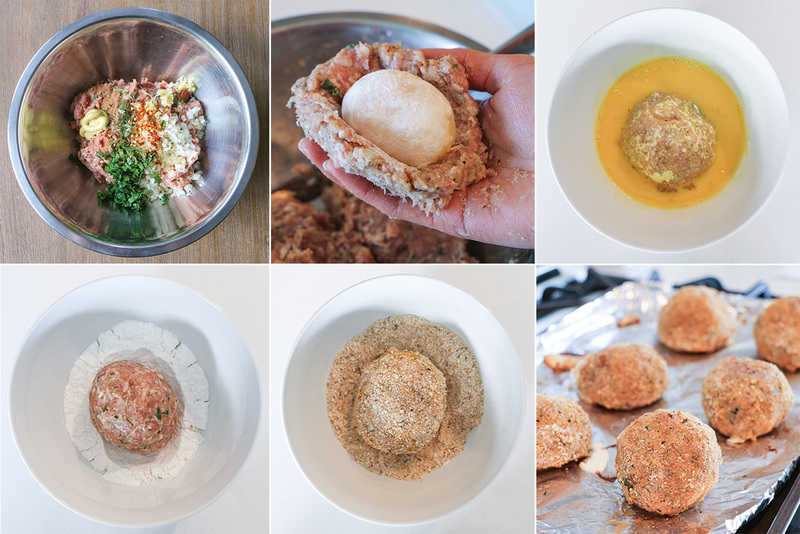 I’ll definitely try this method again if I fry the Scotch eggs next time. So… here is where everything fell apart. I had everything planned out, but I was so focused on getting the photography right that I completely forgot to cut the eggs in half to see which produced the perfect yolk. GAHHH! Oh dear, the top row of Scotch eggs look so depressing haha! I’m still trying to get the food photography down. I’m learning, but it is definitely still a work in progress for me. By the time I had realized that I had forgotten to cut into the yolks it was too late, I’m pretty certain the inside kept cooking and set the yolk. So I can’t tell 100% which method worked the best. 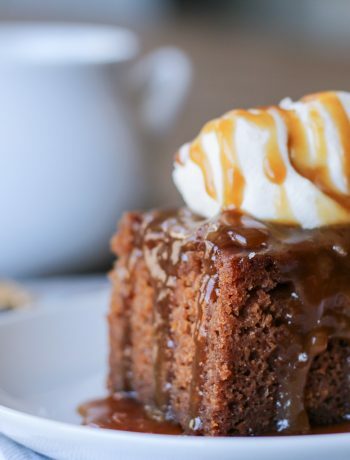 Due to my silly mistake, I’ve edited the recipe to eliminate the freezing process. I suggest soft boiling the eggs for 4 mins, this way the egg white will have just started to set. If you are uncomfortable with handling delicate eggs, you may want to cook them for 6 mins, this would produce a firmer egg white. Boiling for 2 mins would be too premature as the egg whites would not have set. It would definitely be too hard to handle while trying to form the meat mixture around such a delicate egg structure. 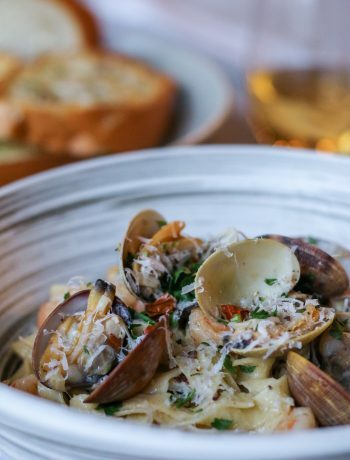 You don’t have to worry about the shells being impossible to peel, letting them sit in an ice bath not only stops the cooking but it also separates the membrane from the shell, thus making it easier to peel. Soft boiled eggs wrapped in sausage mixture - what can be better? 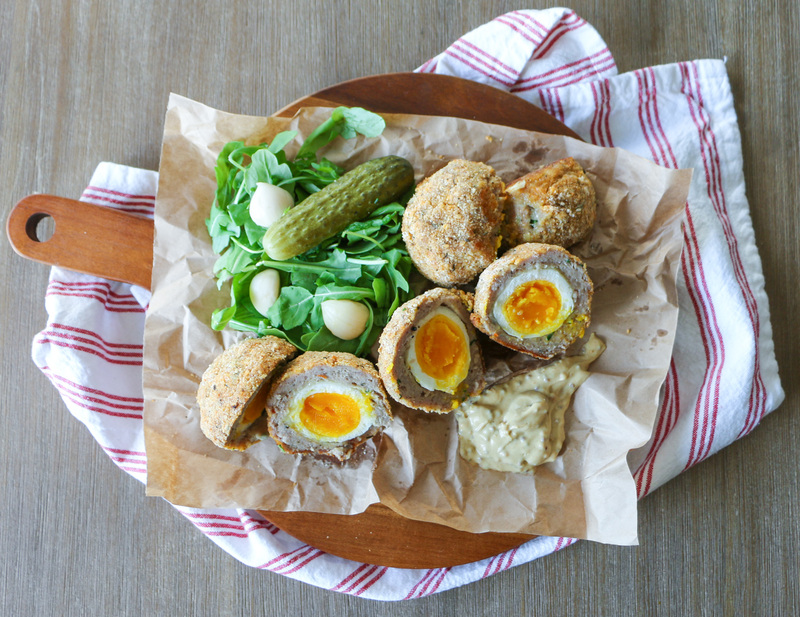 Baked Scotch eggs are perfect for those looking for a healthy snack. 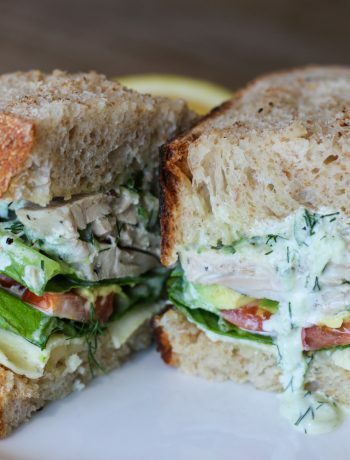 These can be easily taken on-the-go or eaten with pickles, cheese, and mustard sauce. Bring a pot of water to boil. Carefully lower the eggs into the boiling water with a slotted spoon and cook covered for 4 mins (or 6 mins depending on your preference). Remove the eggs with a slotted spoon and immediately place in an ice bath. Let sit for 10 mins, then carefully peel. To prepare the sausage mixture, remove the sausages from their casings and place into a bowl. Add the rest of the sausage mixture ingredients and mix with your hands. Divide the sausage mixture into 6 servings. Pre-heat your oven to 425 F and line a cookie sheet with aluminum foil and spray with oil. Prepare the dredging station. In the first bowl, add a good amount of AP flour. In the second bowl, crack one egg, add a splash of milk, and mix with a fork. In the third bowl, add enough breadcrumbs and seasonings (garlic, S&P, Italian seasoning, cayenne). To make the Scotch eggs, lightly flour your hands first. Take one portion of the sausage mixture and flatten it in the palm of one hand. Roll the peeled egg in the flour and place it in the middle the sausage pattie. Gently shape the sausage mixture around the egg using your hands. Place the Scotch egg on the cookie sheet and repeat steps 6 to 6 for the remaining eggs. Cook for 30 mins at 425 F. Halfway through cooking, flip the Scotch eggs for even browning. 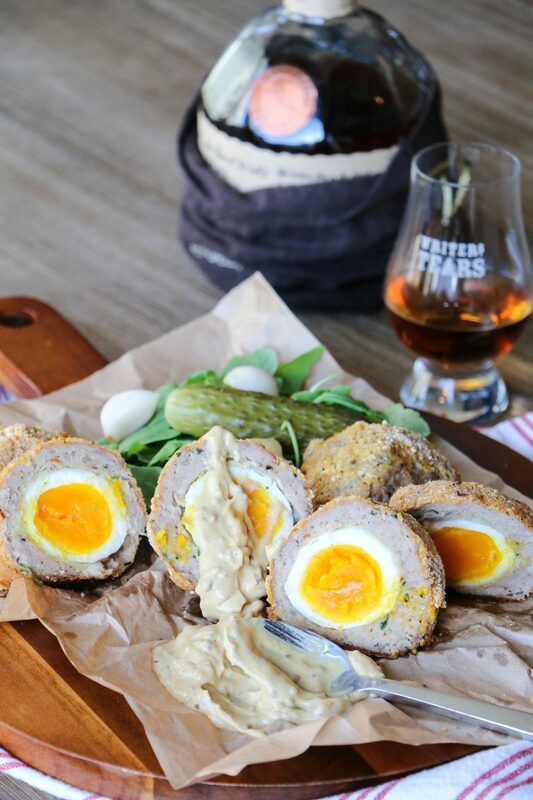 While the Scotch eggs bake, make the mustard sauce by mixing mustard (I used Grey Poupon and Chipotle Beer Mustard) with equal amounts of mayo. Carefully remove the Scotch eggs from the oven and plate. Cut immediately or the yolks will continue to cook. THANK YOU so much for this posting! I was searching the internet high and low for a soft boiled baked Scotch egg. I am so excited to make these thanks to your determination. Thanks for visiting Jamie. Let me know how they turn out for you!